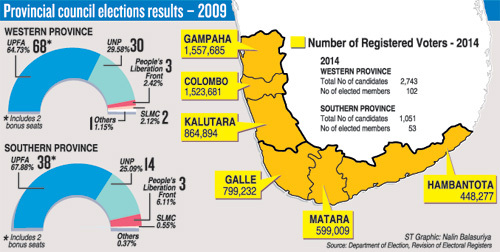 The JVP’s election campaign for the Western and Southern Provincial Councils elections is being carried out under the party’s policy manifesto titled “Ape Dekma” (Our Vision) which was launched on February 2, at its 7th National Convention. The manifesto categorically addresses virtually every sector of the country which should be restructured and improved. Education being one of the most highlighted topics, it describes the prevailing differences between the national schools, provincial schools, super schools and Navodya schools and their removal, while maintaining that the Government should take responsibility for all the education institutes.It says the education sector will be alotted to at least 6% of GDP. Pre-school education will come under local governmental purview, whereas the formulation of its syllabus, appointing trained graduate teachers and inspection, will be the responsibility of the National Education Commission. Universal access to healthcare is assured by the JVP manifesto, saying that the National Health Service which comprised of Allopathy, Homeopathy, Ayurveda and Indigenous medical treatment, will be adequately expanded. The manufacturing sector is promoted in the policy manifesto and private companies which participate in its promotion have been assured of being freed from taxation for five years initially, with other facilities being provided. The manifesto assures that agricultural and fisheries industries will be improved.Improvements in the plantation industry, tourism sector, environment, infrastructure development and the sports sector have also been addressed in the JVP manifesto.